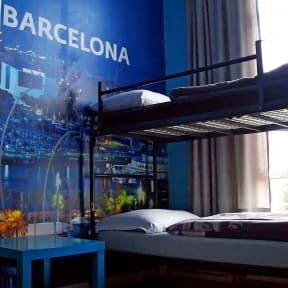 Amsterdam Hostel Annemarie i Amsterdam, Nederland: Bestill nå! The rooms are small, and our didn't have a window so it got really hot. Wish there were some sort of storage for our things, but there isn't. The bathroom was very small and the light wasn't working properly. The staff was helpfull but really defensive. We rented bikes, whitch was great and cheap, but the staff made us pay for another day when we were a few minutes late when delivering them. But all in all the hostel was alright and didn't smell of drugs, like other hostels in Amserdam. Bedbugs, dirty floor. not a single soap for the toilets. We have stayed at hostels all over Europe-this one in Amsterdam is like the other ones evil sibling. I would not recommend it to anyone. 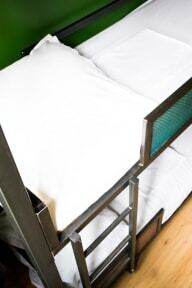 You just cant pay 54 euros for a bunkbed in a room for two where its hardly possible to fit in two persons!! noise and no towels to use in the mini-shower on 1.floor. The only positive thing was the Greek member of Staff.